As you drive by the State Theatre you will see that it now sports a brand new coat (or two or three) of paint. While neither the State Theatre for the Arts non-profit nor the State Theatre Steering Committee can take credit for the enhanced beauty of the theatre, we would like to acknowledge the hard work and financial commitment made by owners Dr. Ron Clark and Ben Sale in beginning the restoration process of this community treasure! 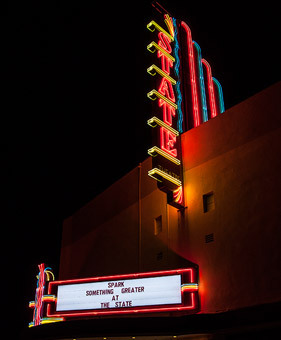 In accordance with our recently adopted Strategic Plan, the State Theatre For the Arts, the State Theatre Steering Committee and numerous community volunteers are very busy working in six different planning areas designed to provide the tools for the acquisition, operation and restoration of the State Theatre as a community held property. With the hard work of these folks, the continued interest and cooperation of private ownership and most importantly, the broad based support of this wonderful community, we remain confident that our goal of acquiring the grand old State Theatre can become a reality by early 2011.